My sisters and I would always urge our mom to start at the deli when we accompanied her to the supermarket growing up. Actually, we referred to it “The delicatessen!”, another one of those words (like “pocketbook”, “dungarees” and “tunafish”) that my family brought over to California from New York. Whatever you want to call it, we loved the counter for one reason: the samples. My mom would buy the cold cuts for the week (we knew this as “lunch meat”) and inevitably the clerk would run a few extra slices for us to snack on. This would buy my mom a few minutes of calm while she attempted to shop with three kids in tow. It was during one of these childhood delicatessen sampling sessions that I first tried Jarlsberg cheese. It had holes and a cool name that started with a “j” even though it sounded like it should start with a “y”. It wasn’t bright yellow, square shaped and individually-wrapped and no one in my Girl Scout troop had ever heard of it. This was some fancy cheese. And I declared it as my favorite. Jarlsberg is one of those Alpine-style cheeses that Gina Freize from Venissimo Cheese told me were the best melters out there. 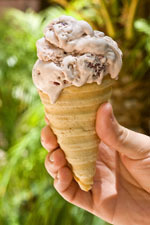 It gets nice and stretchy when it melts and the mild, nutty flavor pairs well with so many other foods. I thought I’d give my Jarlsberg grilled cheese sandwich some springtime flair with wispy blades of shaved asparagus and a homemade arugula pesto, with just enough lemony acidity to cut the richness of the cheese. My favorite cheese from childhood parlayed into my grown-up palate – I loved it! Leave a comment on this post telling us your favorite cheese from childhood. The giveaway will close on Sunday, April 29 at noon PDT. [THE GIVEAWAY IS NOW CLOSED] I will use random.org to select one winner and announce the winner in this post. I will contact the winner via e-mail – if I don’t receive a response within 5 days I will draw another name. My apologies to international readers, the prize can only be shipped to continental U.S. addresses (not Alaska or Hawaii). **UPDATED 5/1/12: Congratulations to our winner, #110 Ray! Using a blender or food processor, blend the garlic and walnuts for a few seconds until they’re the texture of a coarse meal. Add the baby arugula. Continue to blend, drizzling in the olive oil until the pesto is completely puréed. Add the cheese, lemon zest and lemon juice and blend until they are fully mixed in. Transfer the pesto to a small bowl, taste it and season with salt and pepper as needed. Let the pesto stand at room temperature for an hour to let the flavors combine. For each sandwich: Spread a few teaspoons of pesto on two slices of bread. 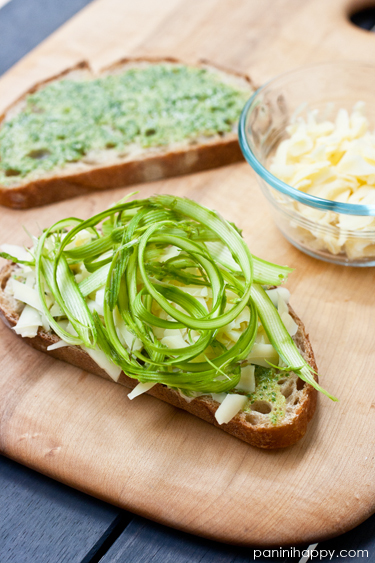 On one slice of bread add a few tablespoons of shredded cheese. Top the cheese with a small handful of shaved asparagus (about 2 spears’ worth) and more cheese. Close the sandwich with the other slice of bread, pesto side down. Spread a little butter on top. NOTE: This recipe makes more arugula pesto than you’ll need for these panini. You’ll love it on lots of other sandwiches, pastas, pizzas – anywhere you’d enjoy a bright punch of flavor. Store any extra in a tightly covered glass or plastic container in the refrigerator for 4 to 5 days or freeze it for up to 2 months. Today’s post was sponsored by Jarlsberg USA. I was compensated for my time, however my opinions are, as always, my own. Good ol’ sharp yellow cheddar was always a standard in our house. We used it in everything. Favorites were grilled cheese on sourdough and quesadillas. Yum! Childhood favorite – good old cheddar! I like Jarlsberg USA on FB. Cheddar on baked potatoes, and in sausage-cheese biscuits. I’m giggling, because Jarlsberg was the first “exotic” cheese we discovered, too. I think I was in college at the time, and it made me feel very grown-up to make my grilled cheese sandwiches with it! This may be blasphemy, but I have fond memories of “government” cheese eaten at friends’ houses. This is a grilled cheese I would not be able to resist! My favorite cheese growing up was Velveeta. I know it’s a processed cheese, but we always had it at the house. We also always had Colby. I didn’t like Colby for a long time after I grew up and moved away, but I’m happy to report I love Colby again. Not that this is my favorite cheese today, but the ONLY cheese from my childhood was velveeta! I know, I know. But it was ooey gooey good! My favorite was a sharp white cheddar with mustard and sardines..I was an odd kid. Roquefort on a baguette! even on pizza, divine! My favorite cheese from childhood was colby-jack – I just always thought the two colors were so cool! when I was little we never had anything other than american cheese in the house. I would occasionally eat a slice of sharp cheddar with my grandfather, but it wasn’t my favorite. now you can’t get me near most american cheeses and & refuse to use velveeta for anything. lol we mostly stick to firmer, stronger cheeses. I like Panini Happy on Facebook. I liked Jarlsberg on FB. It almost makes me cringe to admit that wrapped American cheese was my childhood favorite. Although my taste buds have now grown up, I admit to guiltily enjoying a slice of “wrapper cheese” on very rare occasions. I have always loved Colby Jack! I just opened a wedge of Jarlsburg this week! I’ve been using it to make tuna melt sandwiches (we always call it tunafish, too) for dinner, but I believe I’ll have to lay hands on some asparagus and try your grilled cheese. I have to say my favorite cheese growing up was the melted cheddar on top of burritos or seven layer casserole. Simple tastes. I also have the e-mail subscription to Panini Happy. 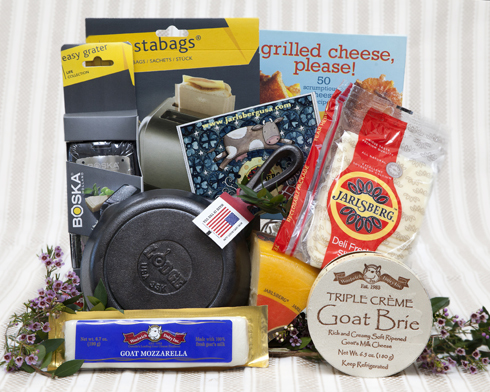 American cheese, velvetta or can cheese was my favorites when I was a kid…thankfully variety has entered into the palate…I think Jarlsberg and Brie are my favorites now! My favorite cheese from childhood was mozzarella as in pizza pie. We didn’t have very refined tastes back then. Now I keep trying new cheeses and like most of them. My latest has been goat cheese. I schlepped to A&P last night to get a small package, since it was on sale. I will definitely try Jarlsberg. 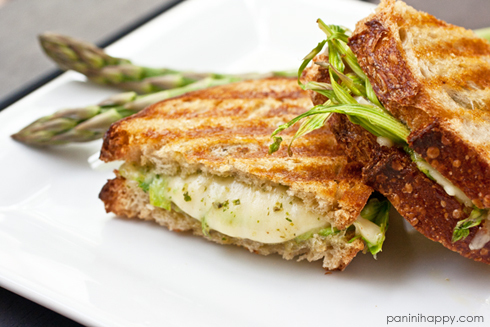 Jean´s last blog post ..Grilled Jarlsberg with Shaved Asparagus and Arugula Pesto + Grilled Cheese Kit Giveaway! Colby-jack was a favorite in my home growing up. Something about mixing two colors made it super cool. I like Panini Happy on FB. While I’m a cheese fanatic today, as a kid, I didn’t like ANY cheese. My mom only got the prepackaged American cheese which tasted like paste to me. But I love almost every cheese I’ve ever had as an adult, including Jarlsberg! I grew up eating Kraft American singles – my mom always made “toasted cheese bread” on Fridays and served it along side creamy tomato soup with Parmesan sprinkled on top. American cheese is comfort food for me so in some ways, it’s my favorite. Cool giveaway! Good Ol Kraft American slices. It was the staple food item in our house as a kid… Just can’t go wrong with the way it melts. Cheese Whiz in the can had to be my favorite when I was a child. We hardly ever got to have it and when we did. Oh, so fun! Now it makes me gag. Liked both pages, subscribed to the newsletter and followed on pinterest. My fav grilled cheese growing up was swiss and ham. I liked both pages, follow you on twitter and pinterest as well as subscribed to the newsletter. My fav grilled cheese growing up was swiss and ham. This came right at my lunch time…. mouth. is. watering!!! I was obsessed with string cheese when I was little! My mom never actually bought it, so when anyone else had it and would share, I was stoked! Lol! She may look exactly like her dad, but this proves my genes are in there! As a kid, colby, because I didn’t know much e3lse, but as an adult, give me Jarlsburg anytime! My favorite cheese growing up, and even to this day, is swiss cheese. I know it gets a bad rep, but it’s my go-to snacking cheese of all time! And I also follow PH on Pinterest. I like Happy Panini on Facebook. I like Jarlsberg USA on Facebook. My favorite cheese was Cowgirl Creamery’s Mt. Tam. I used to beg my mother to buy it for dinner parties. I still love it! You’re so lucky! I’ve still never tried it but I really want to. I always love muenster. That orange edge and soft creamy texture. Plus I could call it “monster cheese” which always made me giggle. I remember my mom buying dill havarti for a party when I was little, and I tried it and loved it – I felt very sophisticated! I liked panini happy on Facebook. Brie Cheese between perfectly toasted slices of Pound Cake with Raspberries. Ooey gooey brie with the sweet bread and a kick with a raspberry-the perfect bite. Might sound crazy but its the perfect combo. That actually sounds pretty great to me! My favorite growing up was string cheese. I don’t know why I never buy it now! My favorite cheese from childhood was Kraft Singles. I loved them!! I subscribe to free updates from Panini Happy via e-mail. So pleased to be following you on pinterest. As I child I really didn’t have any exposure to good cheese. But living overseas as an adult really made me aware of what I’d been missing. I now love a creamy brie but my favorite is what my Dutch friend would bring to me from home and she simply called it Old Dutch Cheese. Pretty sure she meant “aged”. This is an odd one, but my favorite cheese growing up was salami cheese. My grandmother always seemed to have some on hand for snacking, and if I’m feeling nostalgic, sometimes I’ll pick up a small block. I’m also now following you on Pinterest! Following on Pinterest – thanks so much! I “Liked” Panini Happy on Facebook. I “Liked” Jarlsberg USA on Facebook. 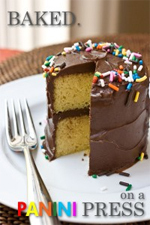 I loved Kraft single as a kid…..it’s my shameful little secret. As a child, I loved cream cheese best. As an adult, I discovered that a slice of sharp cheddar, a healthy spreading of cream cheese on buttered slices rustic garlic clove bread, makes one amazing grilled cheese sandwich! Cheddar was always my favorite! My favorite was just traditional cheese slice inside, but now I add some cream cheese and my girls think it is extra fancy. Melt the mozzarella, spread the cream cheese on and top with tomatoes. Oh, so tasty. I’m also a fan of Panini Happy on facebook. And now a fan of Jarlsberg USA on facebook. Aaaand now I’m subscribed to your email newsletter! When I was little, my dad was the manager of a grocery store. My brother would always go up to the cheese counter and ask to sample their smelliest cheese. However, I loved (and still do) Parano cheese! It seems so gross now, but I loved Velveeta as a kid. I don’t touch the stuff now, but it really appealed to my 5 year-old palate! Kraft singles in my school lunch was always my childhood favorite! My favorite cheese as a kid was cooper. Mozzarella was my favorite and it still is, most likely has to do with my pizza addiction. We ate a lot of Velveeta growing up, the log style. I like Jarlsberg on Facebook. Meunster was my favorite! Still near the top of my list too! i didn’t grow up with much cheese in the house, all we had was velveeta to make mac and cheese. so that was my favorite~! Always have and always will love Swiss cheese. Turkey, apple and cheddar. Yummy! I loved mozzarella cheese as a kid!!! I also already have you in my Reader and follow you there. I’ve liked Jarlsberg on Facebook as well and I now follow you on Pinterest. Thanks for the inspiration and ideas for grilled cheese! I used to love making grilled cheese sandwiches with mayo and provologne cheese. my favorite cheese as a kid was muenster. i think it had more to do with the name than anything else, but i still love it! like panini happy on facebook – check. like jarlsburg usa on facebook – check. Our family favorite when I was a kid was hoop cheese with the red wax around it. I have been subscribed to your blog by email for awhile – we love to make sandwiches especially pressed ones with lots of cheese!!! As a kid I loved loved Harvati cheese I would just eat it like a crazy person! We used to LOVE single slices of American cheese that my Gramma bought. Apparently it was too expensive for my mother’s grocery cart so it was a real treat when we visited our grandmother! Omg those tostabags are such a clever idea!! I want! My favorite cheese from childhood is Camembert. My grandparents always had some after meals and I loved it. My favorite cheese growing up was mozzarella. I think my favorite “cheese” growing up was Velveeta. Won’t touch the stuff now. But my mom didn’t buy us a lot of variety. I remember processed cheeses, cheddar and mozzarella only. I loved colby jack growing up and it’s still one of my favorites! My favorite cheese from childhood was definitely cream cheese! I loved a three cheese olga growing up, which is Swiss, cheddar and Monterey jack all wrapped with a delicious flatbread. Looks like I found this just in time! Going to explore this blog more. I was kind of obsessed with Laughing Cow cheese wedges when I was a kid. when i was a kid i didn’t like cheese unless it was melted, thankfully now i’ve grown into eating anything that remotely seems like cheese. Thanks for the recipe! One of my favorite cheeses growing up was smoked gouda. I always thought it was neat that the cheese came in the wax wrapper. My mom used to make grilled cheese sandwiches with gouda. I still add gouda to my Loaded Cheese (5 cheese) panini and everyone seems to love it in the sandwich. I love Grilled Cheese! My favorite cheese from childhood was sliced American. I follow Panini Happy on facebook (Rust Hawk).